How much protein do you actually need? The simple answer is: More than you think. Let’s start with the basics. Protein is one of the three main macronutrients, along with carbs and fat. Protein is essential to almost every function in your body. Your cells themselves can’t work without protein; your hair, skin, and nails are built of protein; and your muscles need protein to grow and repair. Protein is also helpful in hormone balance and mood support. It really IS as important as you hear it is. Aside from being necessary in order for your body to function properly, protein is also beneficial for weight management. Eating protein is a great way to stay satisfied. Protein triggers the release of several satiety hormones that send signals to your brain to “put the fork down.” Plus, protein is also tough for your body to digest. That means your body actually burns a significant amount of calories processing it. (More than when you eat carbs or fat.) So, when you add protein to your meal, not only do you fill up sooner and eat less, you actually burn more calories. Eating protein also protects your muscle mass, which begins to decline after your 30th birthday. Maintaining muscle mass is important because it keeps your body strong and healthy, sustains your figure longer, and keeps your metabolism humming. Yay, muscle! So, how much should you eat? We think the recommended daily allowance (RDA ) of .08 grams per 1 kilogram of body weight is probably a little low for most people. Krissy Kendall, Ph.D., and professor of exercise physiology at Edith Cowan University in Perth, Australia explains the problem with the current RDA for protein is that it’s based on the needs of completely sedentary individuals. “Research over the past 10 years has shown that individuals involved in even moderate levels of physical activity (30 minutes of activity 3–5 days per week) need more than what the RDA currently recommends. For highly active individuals, studies have shown they need double what the RDA recommends, or 1.6 grams per kilogram of body weight (or about 0.8 grams per pound of body weight),” Kendall explains. 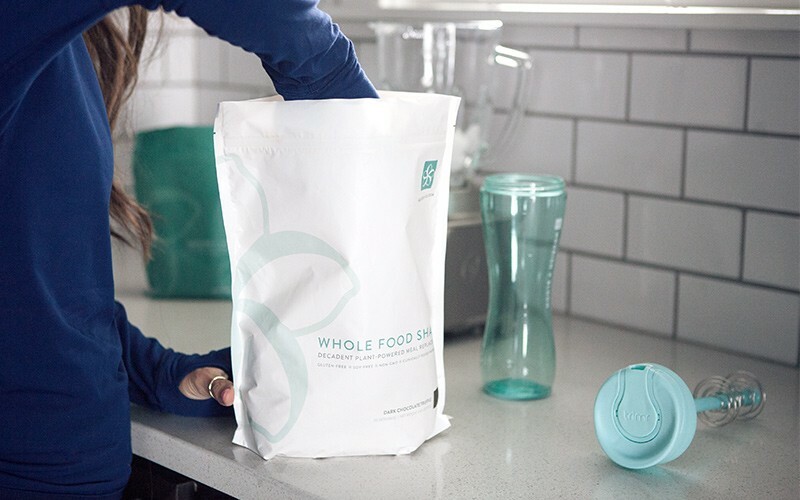 “Needless to say, whether you enjoy spending your afternoons gardening, chasing after your 2-year-old, or lifting weights, you’ll be better off by adding more protein to your diet,” says Kendall. We think you should aim for something like 1.2 grams of protein per kilogram of body weight. Now, don’t get caught up in the numbers. Instead of trying to count every gram you put into your mouth, aim to make 25–35% of your diet protein. When you’re snacking on something, or eating a meal, make sure 1/4 — 1/3 of it is protein. That’s pretty simple, right? The problem with many “protein bars” is that there really isn’t much protein in them. If your protein bar doesn’t have at least 12–15 grams of protein in it, find a new one. Our Whole Food Shake and Vegan Protein Snack Bars were made with you in mind. We’ve put enough protein in both of them to keep you feeling full and to help your muscles stay strong and healthy. Other great sources of protein are chicken, beef, fish, eggs, and tofu. What Can Your Protein Do For You?